Combine 2 tablespoons dressing and chicken in a zip-top plastic bag; seal. Marinate in refrigerator 45 minutes, turning bag occasionally. Thread bread cubes onto 2 (12-inch) skewers; coat with cooking spray. Place skewers on a grill rack. Grill 1 minute on each side or until browned. Remove chicken from bag; discard marinade. 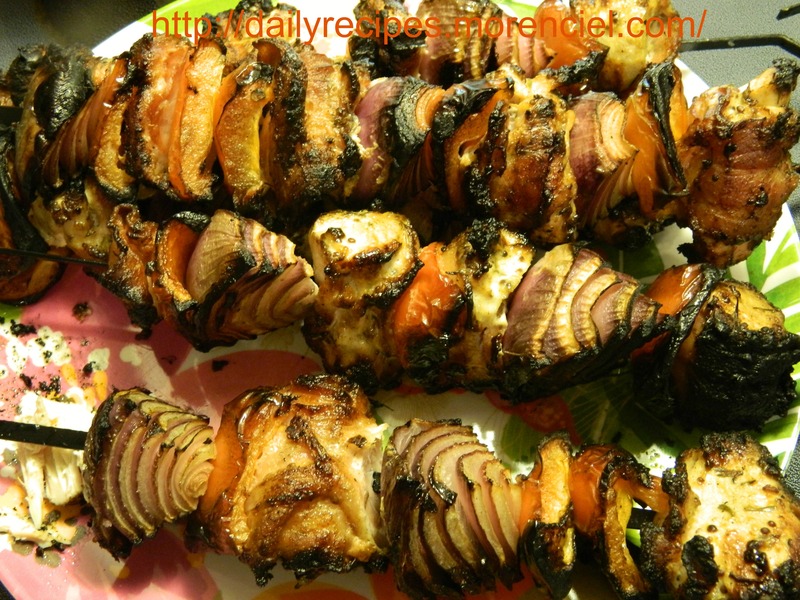 Thread chicken and onion alternately onto each of 6 (12-inch) skewers. Place on a grill rack coated with cooking spray; grill 10 minutes or until chicken is done, turning occasionally. Remove from grill; drizzle each chicken skewer with 2 teaspoons dressing. Combine remaining 6 tablespoons dressing and lettuce in a bowl; toss well to coat. Place about 1 cup lettuce mixture on each of 6 plates; divide bread cubes evenly among plates. Place 1 chicken skewer on each plate. Top each serving with about 1 tablespoon cheese; sprinkle with pepper.